Sea, Sand & Sky: The Seafood Festival! This past Sunday I got the chance to work one of the shifts at the seafood festival and it was so much fun! Last year was my first time coming to the seafood festival and it was a ton of fun so I already knew what to expect. This year however, there were a bunch of more stands of food and other stations to visit and especially many new things to learn about. To start of, where we were stationed at, we had fish printing and shell painting. 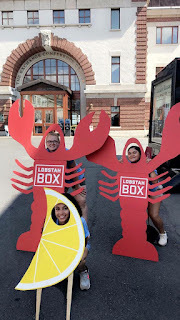 Also I got a really cool shirt from a company that was stationed right next to us named Lobster Box and we took a bunch of funny pictures. Aside from the fun pictures and awesome free shirts, one of my most favorite things to do at the seafood festival ever since last year, is shell painting! There were over 200 sea shells spread out on the table all for the kids to come and pick a shell of their choosing and let their imagination run through the tips of their paintbrushes! We had all types of paint colors and glitters to put on the shells. One of the little girls bedazzled her shell with glitter and purple hearts everywhere! Although it got a bit messy, it was still nice seeing the smile on the kids faces when looking at their shell-sized master pieces. Not only did the kids paint shells, I also got to paint a few myself and we got a bit creative. Last year Nieomi and I painted Nemo, Dory, Spongebob and Patrick. This year we decided to keep the trend going by painting Mermaid Man and Barnacle Boy on the sea shells which came out better than I had expected! This Seafood Festival is definitely one of the highlights of my summer so far. Not to mention I also got some cute dolphin and turtle temporary tattoos at one of the stations too! In preparation for painting shells! I really can't wait till the next seafood festival because I had a blast at this one.